​In this review, we will try to answer what is the best penetrating oil on the market. But first, we will be talking about what is penetrating oil, the things should you look for when buying one, how to use it, and many more. Anyhow, the most important thing when it comes to penetrating oils is performance and effectiveness of these products. Penetrating oil can be a fast solution to the major problems. Rust is a difficult problem, and parts which got rusted by the time are really hard to replace. Having good-quality penetrating oil might save you some energy and nerves. ​In order to give you a wider picture of our chosen product list, we will be discussing their advantages as well as disadvantages. And finally, on the bottom of the page, you can see frequently used questions- some may help and spare you some time. ​Simply speaking, penetrating oil is a liquid that obtains extremely low viscosity. This type of oil is mostly used for mechanical purposes. In other words, using this penetrating oil on some mechanical parts will loosen them, if they got rusted by the time, and enable their removal and replacement. ​Now, the most common parts that need to be loosened are bolts and nuts. In other words, there are small, thin spaces between the rusted parts and the only thing that can be effective enough to loosen them are penetrating oils. Anyhow, penetrating oils are not only used for this purpose. They are frequently used as cleaners, corrosion presenters or lubricants. In general, where metal locked in place, penetrating oil should be your weapon of choice. It’s also known as the “rust buster” and is quite useful both for home use and in industrial plants. Furthermore, the most common usage of these oils is for engines with high mileage. Anyway, using penetrating oil on this type of an engine will secure longer protection as well as lubrication that won’t freeze, melt, or run off. The penetration oil is safe to use on the different type of materials. The most common ones are wood, rubber, plastics, leather, as well as metal parts. ​Now, we have chosen top 15 penetrating oils which are by our humble opinion some of the ​top penetrating oils all around the world. Let’s start now. This penetrating oil is one of the best on the market. With long-age experience in making oils, Kano Laboratories has become one of the leading penetrating oil manufacturers out there. ​There is no similar penetrating oil on the market. Simply speaking, a performance of this one is outstanding. This penetrating oil will easily loosen rusted nuts and bolts. Also, if you have problems with frozen pulleys or shafts, just apply it and wait for a few moments. It will free it with enormous speed. Furthermore, this penetrating oil will penetrate crevices small as 1 millionth inch and dissolve rust, lubricate and clean as well. There are several reasons of metal freezing. Compression, corrosion, electrical interrelationship, or thermal variations are just some of the factors that may cause this problem. With Kano Kroil penetrating oil, these problems will be easily removed. Also, this penetrating oil will provide lubrication, prevent rust, and displace water. ​Effective- Few minutes after applying it, you should see the results. Approximately won’t take more than 15 minutes. ​Lightweight- With only 2 pounds and its compactness, you can carry it around with yourself. ​Great rust prevention- After applying it, you should not worry about rust. Apply it every often and keep your things rust-free. ​Lubrication- Anyhow, this penetrating oil will only be a temporary solution when it comes to lubrication. It will not remain there for a long time. All in all, this item pays great value for the cash. It belongs to affordable price point category and buying one can be really worthy. Coming from Kano, this penetrating oil is a top-class product which will effectively solve your problem. There are 3 different sizes, 10 OZ, 13 OZ and 16.5 OZ. ​Creeping into small openings, this penetrating oil will reduce the surface tension and loosen the parts that are stuck. This is an aerosol version of Kroil that will loosen all the frozen parts and metal joints in just a few minutes. Anyhow, be careful where you use it because it might dissolve certain materials, such as gum or dried grease. On the other hand, the metal will be safe and sound. Also, this penetrating oil will displace water, and secure long-lasting lubrication. Other than that, it will secure good protection against rust which can be quite problematic. Furthermore, this penetrating oil has great cleaning part. It will definitely clean old metal parts and make them move just like new. Of course, in order to look new, you are going to need some manual cleaning to remove debris. ​​Good cleaner- ​This penetrating oil is a great cleaner. Old parts will work like new, and with just a small manual-cleaning effort, it will look like new as well. ​​Great protection- ​After applying it, this penetrating oil will be a great and long-lasting protection from rust. ​​Good lubrication- ​The penetrating oil has additives that provide good lubrication. Performance- Within only a few minutes, this penetrating oil will take effect and loosen stuck parts. ​​Dissolving effect- ​Some materials are not proof to this penetrating oil. Be careful on which materials are you using this penetrating oil because it might simply dissolve it. ​The price is good, it belongs to affordable price point category and the value you get is, simply speaking, more than satisfying. In order to reduce friction or loosen some parts, consider buying this amazing penetrating oil. It will silence squeaky components, remove the grim and grease with outstanding power. ​This compact penetrating oil package has a unique design. Its drip applicator and squeeze bottle will allow great control over applying process. Moreover, the penetrating oil will prevent components from adhering, reduce friction and prevent corrosion. Furthermore, this penetrating oil will penetrate into crevices and release parts that were even stuck together for a long time. Also, this powerful penetrating oil is great for cleaning tools. It will effectively remove grime and dirt. The important thing about this lubricant is that has no odor or any unusual smell. ​​​Great lubricant- ​​This 3-in-one oil has powerful lubrication. It will loosen the most difficult parts, and ease their removal or function. ​​​Great penetration- ​​With its power, this oil will penetrate deep into the crevices and act fast. ​​​Odorless- ​​Anyhow, this penetrating oil is odorless. ​Easy application- ​The penetrating oil has drip applicator which will ease the entire process of application you can. ​​​​​ ​Opening- The cap is a bit hard to remove. ​With this small investment, you might prevent further problems. ​This penetrating oil is a product of Liquid Wrench. Since 1941, Liquid Wrench has gathered experience and developed methods of making the most effective penetrating oils. It is quite popular as the best penetrating oil for rusted bolts. ​This fast-acting penetrating oil will easily penetrate corrosion and loosen rusted bolts and nuts. Its formula will effectively dissolve rust and cut through grease. Stuck nuts, locks, and bolts won’t be a problem anymore. Furthermore, this penetrating oil has a high amount of lubricity and solvency. On the other hand, what this penetrating oil offers is low viscosity and surface tension. This one is a multi-use penetrate with precious spray straw for easier applying. Now, all those surfaces that were hard to reach are way easier to apply. Speaking of, after applying, this penetrating oil will act fast. Estimated time for this penetrating oil to act is around 7-10 minutes. Sometimes, for extremely small crevices, it might take a bit more time. ​Preciseness- There is a spray straw that will ease the applying process for you. ​Performance- This penetrating oil excels in the field of performance. It would successfully remove any problem, and prevent upcoming ones. ​Durability- After applying it, it will protect from rust for a long time. ​Odor- The only downfall of this penetrating oil is its odor. ​The penetrating oil is super worthy. Investing small amount will spare you some time or nerves dealing with rust and other mechanical problems. This penetrating oil has found a great usage in heavy manufacturing operations. ​Now, this penetrating oil is one of the greatest penetrating and lubricating oils out there. This oil can be used in industrial purposes, such as decreasing friction and wear, prevent parts from sticking, stopping corrosion, etc. Also, why would you bother with other methods to loosen something, when you simply can get this cheap solution and do the job in just a few minutes after applying. Anyhow, it takes no more than 10 minutes to act. Furthermore, it has shown as a good lubricant and rust protector. The only downfall is that you are going to need several applications in order to achieve full effect. ​​Great lubricant- ​After applying, the surface will be temporarily lubricated and loosen. ​​Rust dissolving-​ Breaking the iron oxide loosens all the stuck parts. ​​Water resistant- ​Anyhow, after applying, this penetrating oil will secure waterproof and rust-free surface. Active penetration- Once you spray it, the oil will penetrate crevices small as one-millionth part of an inch. ​​Oiling routine- ​You are going to need patience with this one and apply it every often. ​This penetrating oil has a good price and holds good value for that price. This one is specially manufactured type of penetrating oil. With ages of experience, the manufacturer has finally discovered a unique formula. ​What makes this penetrating oil different from others is a unique ion activated formula. In other words, it won’t burn off. Moreover, with its enchanted affinity for metal parts, it will quickly take effect and loosen up all the stuck parts. Also, this will help Castle Thrust to penetrate into small crevices in order to loosen up nuts and bolts. Once you apply it, it will foam upon the metal and not run off the metal surface. Also, this penetrating oil has great temperature resistance. Furthermore, the penetrating oil is a great lubricant as well as a rust prevention. This product comes with the package of 15.75 Oz and belongs to affordable price point category. ​​​Ion activated formula- ​​Simply speaking this formula will secure penetrating oil from burning off. ​​​Temperature resistance- ​What is the most important, certain parts suffer from high temperatures. This penetrating oil has a great temperature resistance. ​​​Great lubrication and rust protection- ​​With additives and this brand new ion formula, the oil will protect from rust as well as lubricate parts for better function. ​​​The odor- ​​Anyhow, this penetrating oil has a bit stronger odor. As we said, this penetrating oil belongs to affordable price point category and pays great value for the price. The formula for this outstanding penetrating oil was established back in 1957. ​With extremely low surface tension, this penetrating oil will easily get into crevices and loosen stuck parts. Also, it will disassemble rust and keep your surface or mechanical parts rust free for a long time. It can be also used on brakes, suspension or your exhaust system. After applying, B’laster will leave a film of lubricant which will prevent further rusting. The oil is non-evaporating and can handle extremely high temperatures (up to 152 degrees Fahrenheit). It comes in 11 Oz can. Finally, this penetrating oil can be used to enable wet ignition and loosen frozen parts. ​​​​Low surface tension- ​​​This oil will easily loosen stuck parts and lubricate them for better function. ​​​​Good for brakes and suspension system- ​​Anyhow, oil has additives for better lubrication. It can be used for brakes and suspension as an enchanting power. ​​​​Temperature tolerant- ​​​Also, the penetrating oil is tolerant on high temperatures (up to 152 degrees Fahrenheit). ​​​​Hard to apply- ​​​This oil has no straw; therefore, some areas might be a bit difficult to apply. ​The oil belongs to affordable price point category and holds great value for the price. Since it comes in a big pack, value for the price is even bigger than with a single can. WD40 is well-known rust penetrating spray. Is been around for decades and ever since it’s known for its great quality. ​If there are any nuts and bolts that are corroded, do not hesitate and get this spray. Not only will loosen them, but also keep them safe for some future times. Furthermore, this rust penetrant has great power and ability to break any bonds that are holding stuck parts. Also, after applying, it will leave a small amount of lubricant and prevent rust from forming again. It can be used as a cleaner, but in order to fully clean the surface, you will need to clean a bit manually. WD40 is well-known for its structure and formula. It is made of special surfactants, solvents, and so-called blue torch technology. It can be used on locks, chains, bolts, and nuts. Also, it can be used on a plastic and rubber. ​​​​​Plastic, metal, and rubber safe- ​​​​Unlike any other penetration oil, this one can be used on various materials without damaging them. ​​​​​Blue torch technology- ​​​This unique technology is only being used for this spray. It results in a great product which is highly rated all over the world. ​​​​​Great loosening- ​​​​With this spray, you will be able to fast and easy loosen frozen or stuck locks, bolts, and nuts. ​​​​​Strange smell- ​​​​The odor of this one is not bad, simply speaking, it’s strange. ​Anyhow, this product is well-known for its quality. It belongs to expensive price point category but never the less it’s more than worth buying one. Every since 1959, Cyclo has been in the industry of penetrating oils. Today, they are one of the leading manufacturers of penetrating oils on the market. ​This penetrating oil can be used for complete maintenance and in enchanting purposes for your vehicles, such as car, trucks, marine, or heavy-dirty equipment. With ease will disassemble stuck and rusted parts, nuts, and bolts. Moreover, this penetrating oil can be also used for several more purposes. It can be a great lubricant for guns, tools, sport equipment or hinges. The time needed for this oil to act is just absurd. In few moments after applying, it will fast penetrate small crevices loosening up and lubricating stuck parts. Furthermore, this penetrating oil does not contain silicone and it’s safe for body shop use. Finally, this penetrating oil is NSF H2 certified. ​​​​​​NSF H2 certified- ​​​​Unlike any other penetration oil, this one can be used on various materials without damaging them. ​​​​​​Enchanting effect- ​​​This unique technology is only being used for this spray. It results in a great product which is highly rated all over the world. ​​​​​​​Acting fast- ​​​​With this spray, you will be able to fast and easy loosen frozen or stuck locks, bolts, and nuts. ​​​​​​Flammable-​ ​​​​The odor of this one is not bad, simply speaking, it’s strange. ​Not only that is worth, but you can increase that value drastically. Namely, if you buy a pack of few more cans you will spare some cash. Shamrock is one of the biggest penetrating oil manufacturers nowadays. They are well-known by the performance of the oils they make. ​With its amazing formula, this penetrating oil cuts through carbon and rust on bolts, screws, valves, nuts, and car parts in general. After applying, it leaves a protective film that will keep the surface rust-free. This item comes in a can of 10 Oz. With a pack of 12 cans, you will save a lot, and achieve even better value than one bucket would bring considering the price and quality. When it comes to the scent, this product has no unpleasant odor. Whatsoever, it slightly scents like citrus. ​​​​​​​Great value- ​​​​​The quality and quantity you get with this one are much more worthy than the price you pay for it. ​​​​​​​Citrus smell- ​​​​Unlike other penetrating oils, this one has a great odor (citrus). ​​​​​​​​Powerful- ​​​​​Within few moments, all the stuck parts that were applied will be loosened and easily removable. ​​​​​​​Damaging-​ ​​​​​Be careful on which materials are you using it. This penetrating oil might be damaging for certain materials. ​Finally, the product comes in a pack of 12. The price is more than affordable considering quality and quantity. With over than 130 years, this manufacturer sold only high-quality products. Anyhow, this penetrating oil is top-notch oil that will easily solve your mechanical problems. ​This superior penetrating oil is ideal as a cleaner or lubricator. The best possible performance of this penetrating oil you can see with chains, cables, springs, slides, wire ropes and other metal-moving parts. Furthermore, in only a few minutes it will loosen all the rusted and stuck parts that you wish to replace. This product comes in a pack of 12 Oz. Now, for precise applying, there is a thin straw. That way you will be able to point this powerful oil in the right direction. Moreover, thanks to the additives that this penetrating oil obtains, it has shown as a great lubricant and rust protector. ​​​​​​​​Long-lasting lubrication- ​​​​​​Thanks to the additives of this penetrating oil formula, it will provide a long-lasting lubrication. ​​​​​​​​The straw- ​​​​​A great feature of this penetrating oil is a straw that will help in precise and accurate applying. ​​​​​​​​​Great performance- ​​​​​​When used on the metal parts, it will show incredible performance. ​​​​​​​​Lubrication is not permanent-​ ​​​​​​Apply it every often. Although this penetrating oil is a great lubricant, it fades and needs reapplying every often. ​For this penetrating oil, you are going to invest a bit more, but it’s more than worth. The quality that comes with this price is simply speaking- cheap. This excellent penetrating oil is good against airborne dust and dirt. It is made in the USA and It is a great quality product. ​With this spray, you will get free straw which is quite easy to set up and use. That way, you will easily apply spray onto difficult approaching areas and keep your fingers clean. Furthermore, this spray will penetrate the toughest areas and loose bolts, valves, and locks. It will easily get rid of grease, tar, adhesives, and heavy oils. If there is rust that you noticed, just apply this spray. Not only it will dissolve rust, but also keep it rust-free for forthcoming future. When the oil dries, this penetrating spray will provide lubrication that will continue protecting applied surfaces. The main difference between this one and other penetrating oils is that ProTecta is compatible with plastic. Other lubricants might be damaging for this material. ​​​​​​​​​Plastic friendly-​ This spray can be used on plastic materials without damaging it. ​​​​​​​​​Superior performance- ​​​​​​However, the spray excels in the field of performance due to its active formula that loosens every frozen or stuck part. ​​​​​​​​​​Easy applying- ​​​​​​​There is a bonus straw that will ease the application process on the hard-to-access areas as well as save your hands clean. ​​​​​​​​​Applying every often- ​ ​​​​​​​Anyhow, lubricant won’t last forever. If you wish to keep your surfaces smooth, apply this spray every often. ​This spray is just a bit above affordable price point category, but anyway, it is well-worth the money. This low viscosity lubricant and penetrant might be everything you need to overcome your problems. It is designed to deal with bound, seized or frozen fasteners. ​This penetration oil will burst through scale, gum, rust, and corrosion with great power and quickly after applying. It has low tension formula will creep into seams, cracks, and joints with higher efficiency than can be seen in competition. Furthermore, the penetrating oil is easy to use and leaves no mess behind. Its best efficiency you can see when dealing with rust on bots and nuts, clips, snaps, locks, snaps, and many more. The ease of using this product can be described in one sentence- it can be even used upside-down. It is ozone friendly. It has no depleting chemicals. ​​​​​​​​​​No depleting chemicals-​​ ​This penetrating oil is completely ozone friendly. ​​​​​​​​​​Easy to use- ​​​​​​​With a straw, you will be able to easily apply the oil into even hardly approachable areas. ​​​​​​​​​​​Great performance- ​​​​​​​​Anyhow, the oil excels in the field of performance due to its outstanding penetrating power. ​​​​​​​​​​Odor- ​ ​​​​​​​​Whatsoever, the oil might have an unpleasant smell, but it only depends on your taste. ​This penetrating oil might be the cheapest solution for your problems, therefore, it has great value for the money you invest. Pipe Break is fast-acting penetrating oil that is mostly used to creep under rust, corrosion or moisture in order to free bolts, nuts, or frozen joints instantly. ​The oil obtains anti-corrosion additives which will form a kind of invisible bond on the surface in order to protect it for forthcoming time. Anyhow, this invisible bond won’t last forever, so you will need to apply it every often in order to keep it safe. Other than that, it has a great purpose in breaking down the strength of the rust and ease you the removal or splitting those apart. It has really low viscosity and offers super penetrative power. Finally, there is a straw that will ease overall applying process, keeping your hands clean and allowing you to reach hard-to-access areas. ​​​​​​​​​​​Effective- ​​Easily removes rust and loosens stuck parts. ​​​​​​​​​​​Anti-corrosion- ​​​​​​​​This penetrating oil has additives which will keep surface safe from corrosion and rust as long as you are persistent in applying it. ​​​​​​​​​​​​Easy to apply- ​​​​​​​​​Since there is a straw, you won’t be having problems while applying this oil. Even better, your hands will stay clean. ​​​​​​​​​​​Often applying- ​ ​Once you apply it, the oil won’t last temporary. You need to apply it persistently every often. ​This oil belongs to expensive price point category, but the quality that you get with it is more than just worth. This amazing penetrating oil is something that everyone should have in their homes. Not only as a solution to problems but as a preventive measure as well. ​This penetrating oil might be a perfect solution for penetrating rust and corrosion in order to free parts or loosen them. Furthermore, it will loosen grease, tar, white and red lead, and graphite deposits. It has outstanding performance and great value. The penetrating oil belongs to affordable price point category. The best possible performance will show in freeing up pipe connections, bolts, nuts, pillow blocks, locks, and rusted machine screws. The penetrating oil is safe in paint and shop environments. It contains no silicones. With this penetrating oil, there will be no more drilling, torching, or hammering. The penetrating oil will spread in small crevices of frozen or rusted parts and free them in seconds easily. The difference between this and other penetrating oils is in lubricant. In other words, this penetrating oil will deliver lubricant faster than typical solvents. Other than that, this penetrating oil can be used as preventive measures. That way, you will save the money and the energy with fixing the possible problem. ​​​​​​​​​​​​No silicones- ​​​This means that penetrating oil is safe in paint and shop environments. ​​​​​​​​​​​​Great lubrication- ​​​​​​​​​Anyhow, the penetrating oil will deliver lubricant much faster than other solvents. ​​​​​​​​​​​​​The oil will penetrate easily- ​​​​​​​​​​Simply speaking, this penetrating oil will easily penetrate small crevices and do the job with outstanding speed. ​​​​​​​​​​​​Apply it few times- ​ ​​Sometimes you need to be persistent with this penetrating oil. Apply it few times for a better effect. ​Simply speaking, this product is something in what you want to invest. It pays great value for the cash. ​Simply speaking, before buying the penetrating oil, check if it is suitable for the surface you intend to apply it onto. Sometimes, this oil can be damaging to certain materials. ​First of all, certain oils are better at loosening, others at cleaning or corrosion. The purpose that you want to achieve defines what penetrating oil you should get. ​Sometimes, for your own purposes, there might be alternative. Namely, you can produce your own penetrating ​lubricant by adding acetone into the regular vegetable oil. This is the cheapest solution, but sometimes it simply won’t work. ​First of all, there are several functions of penetrating oil. The most important one is loosening corroded, seized or frozen mechanical parts. Penetrating into small crevices is something that only oil can do. In most of the cases, this will ease the removal or separate one part from another. Of course, it also depends on the quality of the penetrating oil. Other than that, penetrating oil has a secondary function. It is a good cleaner and can be used for corrosion. As a cleaner, penetrating oil will successfully remove greases, tars, and rust. Secondly, penetrating oil can be used as prevention for corrosion. ​Anyhow, there are few basic types of penetrating oil. Each one of them has a different structure and regarding that a different effect. ​Based on polyglycol, esters, silicone, diesters, CFSs and such synthetic compounds, this type of penetrating oil has great value and performance. They are more fire-resistant, and for buying one you should probably invest some extra money. ​Now, these ones are made of petroleum or base mineral with vegetable oils, fats, esters and some of the additives, such as sulfur, phosphorus or chlorine. Their most common use is in machining operations in their undiluted forms. ​These one have extremely high water content fluids. They are mostly used diluted with concentration level which is not going above 10%. They are created for some materials that might be damaged with other types of penetrating oils. ​There are few additives which are added to penetrating oil in order to increase the wanted effectiveness. Regarding that, there are micro dispersants, corrosion inhibitors, and EP additives. Micro dispersants are used to envelop graphite, molybdenum disulfide, boron nitride, or PTFE. These additives are good for lubrication. Corrosion inhibitors are additives which are used for eliminating corrosion or at least control it. EP additives or extra pressure additives are added to penetrating oil in order to improve wear resistance. They will create a chemical coating which will prevent seizure, surface adhesion, or sticking. Since there are so many different penetration oil brands on the market, no one could be 100 percent sure that they picked the most suitable one. Anyhow, we are going to discuss some of the top penetrating oil brands now and let you decide for yourself. Let’s see. The first and possibly the ​high-quality penetrating oil on the market are manufactured by Kano laboratories. Simply speaking, the Kano penetrating oils are convenient for any occasion. ​Also, they are based on scientific discoveries at Kano, so, the swift penetration is guaranteed. The Liquid Wrench penetrating oil is excelling in almost any field of performance, also, these penetrating oils are pretty convenient as well. Namely, the anti-seize formula is capable of penetrating corrosion which will loosen the rusted bolts and parts. All in all, this penetration oil is surely one of the best on the market. As for the B'laster, we can say that this penetrating oil is definitely the number one selling product since 1957. The ability to quickly bust loose rusted and frozen parts is definitely going to come handy at some time. Also, this is non-evaporating lubricant that saves a lot of time and effort. As we all know, the WD-40 is definitely the most famous penetrating oil on the market. The WD-40 penetrating oils are also famous for its convenience and outstanding performance. ​Simply put, these penetration oils are definitely worth every penny. The Gasoila penetrating oils come quite helpful when you need to do some demanding and hard job. Simply, these oils penetrate rust, scale, and corrosion as well, and all of that just to free the parts instantly. With the specially designed formula that eats rust, you will find this penetrating oils quite valuable and worth your while. ​WD40 is penetrating oil that can be found in the form of a spray. It will penetrate small crevices and help you break the bonds that held stuck parts together. Also, this lubricant will leave behind a protective layer and prevent rust or corrosion from re-forming. ​What is PB Blaster ​Penetrating ​Oil? 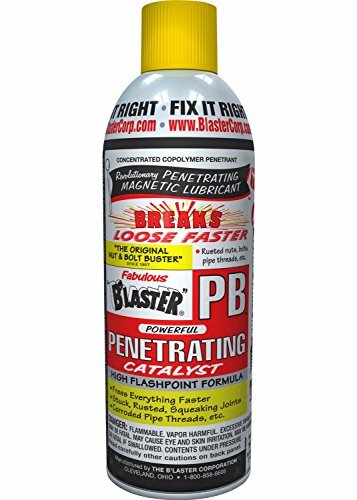 ​PB Blaster is actually penetrating oil with a non-evaporating lubricant which can be used to save time, nerves, equipment, and protect against rust and corrosion. It will quickly bust frozen or rusted parts and help you separate them. ​What to ​Choose ​Between WD40, PB ​Blaster and Liquid Wrench? ​If you are looking for an easy way to loosen something, then choosing one of these 3 might solve your problem. The main difference between these 3 is the price. Anyhow, WD40 has shown to be the most expensive way out of these 3. Liquid Wrench on the other side seems to be the cheapest one. Anyway, WD40 is a bit faster solution, since it takes much less time to act. PB blaster is a “golden middle” and for the price, you will get a great-valued item. ​1. Is penetrating oil harmful for plastic materials? ​In most of the cases, penetrating oil won’t harm or do damage to plastic materials. Anyhow, a certain type of plastic might get dissolved. For example, nylon won’t get damaged, but on the other side, we suggest avoiding usage of penetrating oil onto polyurethane. ​2. Can penetrating oil help with frozen water valve? ​Yes. Just apply it and leave it for a couple of minutes. You should be able to turn on or off your water valve easily. ​3. How much time does penetrating oil need to take effect? ​Most of the cases, you should leave it for about 15 minutes to act. Anyhow, sometimes might take a bit more. It also depends on the oil quality. ​4. Does penetrating oil provide lubrication or only loosening of the rusted parts? ​Yes. All penetrating oils are good lubricants. However, they are just a temporary solution. Anyhow, there are some of the penetrating oils that have additives for long-term lubrication. ​5. Will penetrating oil prevent corrosion? ​Most of the penetrating oils will provide this kind of protection. Some of them will displace moisture and stop oxidation on application. Others will just create a barrier film to eliminate and control corrosion. ​In the light of everything that we previously said, there are different types of penetrating oils. First of all, make sure you use proper one for certain surface. Sometimes, wrong penetrating oil might be damaging. We cannot surely say which one is the ​perfect penetrating oil because every single one acts differently in certain occasion. Anyhow, we have pointed some of the ​top notch penetrating oils on the market. They are all high-valued products considering the price and the quality that you get. Buying one of the products from this list will surely offer you a solution. You simply need to follow this short guide in order to choose the right one. Other than that, you should not use penetrating oil only when a problem pops out. Most of these products that we presented are great prevention of possible problems. Simply speaking, with small investment you can prevent some unwanted money loss that comes later. All in all, we hope that this review will be helpful to you.